Normal delete function in Windows can only delete files metadata but keeps all the information, with which entire file can be recovered by file recovery software. Undelete360 is a Free software that can help you with recovering accidentally deleted files and also assist you to delete your sensitive files with precision to make it unrecoverable with any file recovery software. Undelete360 can be as an installer or as a portable version. The installer version [2.63 Mb] is available at the following link. Both executables are digitally signed by KIRILL CHERMENIN. The software installation went on fast and smooth and requires 8.5 Mb free disk space. Desktop icon is created by default. Display: 1024 x 768 or higher resolution, 256 colors . The software GUI is decent looking and is resizable. You need to select the drive to scan and click on Start. All files will be listed along with status Very Good, Middle, Bad and Overwritten. Overwritten files are not recoverable. You may also view file Previews, Properties & Hex Views of each files in that list. To recover selected boxes, select those files and click on Recover. You may set it to keep folder structure, date/time information etc. 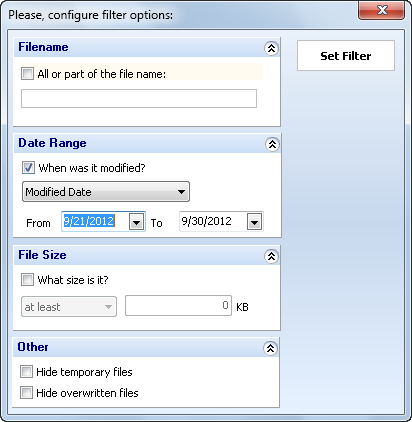 To start with a search, you may also set a filter, to find only files of your choice. The software always keeps a log of its actions. Undelete360 can shred files and folders. It can adopt only two techniques: One pass random (1 pass) and US DoD 5220.22-M (3 passes). It can also wipe drive free space, directory entries etc. The software is really awesome since it covers all the aspects of File Recovery and Shredding. 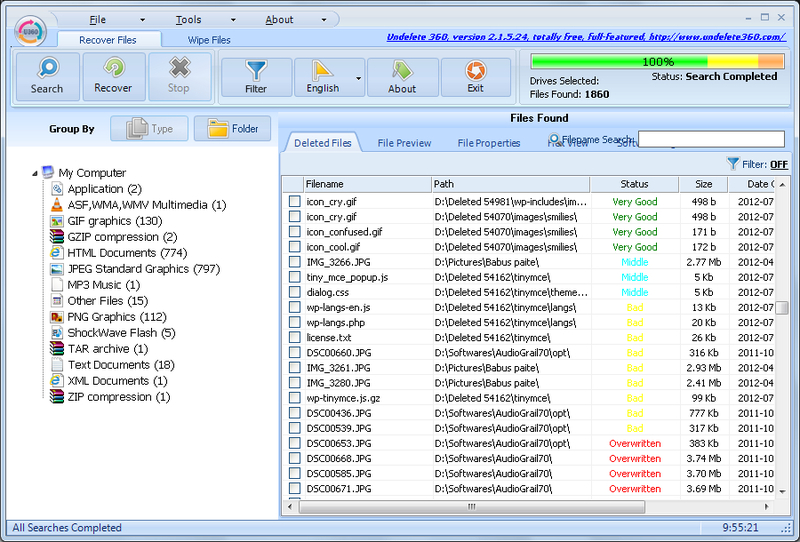 I like its listing of recoverable files and also the file preview, hex-view features. The software is also light on resources at idle time and uses moderately low resources during shredding or recovering. You can use their online guides and videos for better understanding of software usage. This entry was posted in File Management, Free, OS Enhancement, Portable, Privacy Related, Security Related, Shred, Software, Undelete, Windows. Data loss situation may strikes anytime and we should better prepare ourself. I'd also recommend you to review about Stellar Phoenix Partition Recovery (http://www.stellarinfo.com/partition-recovery.htm), a professional software shows preview for free and ensure the best recovery in the industry. Thanks for this helpful and valuable article. It’s pretty decent software. Although most data recovery actions are a gamble if the file has been overwritten by Windows. The best idea is to stop using the partition where the files were. Then try undelete software and pray. I’ve used Reincubate Recover Files when I needed to recover some photos and it did the job.